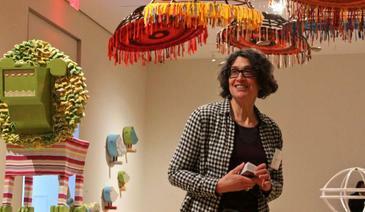 The Philadelphia Museum of Art is giving Shelley Spector her first solo museum show. The sculpture artist has been a longtime Philadelphia figure who had played a big role in raising the profile of other artists. In 1999, she opened the Spector Gallery in South Philadelphia, where many emerging local artists debuted and, for the first time, got their art sold. "I got really excited by what was going on, and I don't always get excited by art," said Spector. "People liked what I was doing, and I was really liking it until I stopped liking it. It was getting in the way of me making work." Spector closed the gallery in 2006 to focus on her own art, and now she is hitting her own big time with a show at the Philadelphia Museum of Art. Spector's work is still as much about other people as it is about herself. The pieces in "Keep The Home Fires Burning" are inspired by an embroidered tapestry Spector found in the art museum archive. Made in the fraktur style of the Pennsylvania Dutch, it was designed by the early 20th century Philadelphia artist Frances Lichten, and sewed by her 82 year-old mother. It says so in the tapestry. The piece was donated to the art museum in 1961, on the event of Lichten's death, by Katherine Milhous. Lichten and Milhous lived and worked together for nearly 40 years. Spector discovered they were nearly inseperable. "It was mysterious how they were presented in research materials," said Spector. "If you Google Lichten, Milhous comes up. But it doesn't say why." Spector found 25 cardboard boxes archived with the Free Library of Philadelphia containing the papers of Milhous and Licthen, including personal letters suggesting Lichten and Milhous were more than colleagues. Spector assumes the two women were secret lovers. Sepector made a tiny chapel with two toy dolls in front, calling it "Frances Loves Katherine." She also made a small tree out of twigs with two Russian nesting egg dolls standing in front, called "Egg Tree," named after Katherine Milhous' best-known children's book. The show's title is a phrase Spector found in their letters to each other, when one was traveling away from home. "Keep the Home Fires Burning" is based on their relationship, Lichten's relationship with her mother — who sewed that tapestry, and expands out to include Spector's relationship with her own mother (who helped her transform a pair of children's chairs into "The Lions of Judah"). It also includes her children, her Jewish heritage, and then expands out to abstract relationships with the anonymous people from whom the artist collected raw materials. Most of her sculptures are made of stuff found in flea markets and second-hand stores that Spector altered through a tremendous amount of hand labor. A hanging sculpture, "From Seeds to Seeds," is a series of suspended bamboo papasan chairs woven with colorful fabric strips ripped from hundreds of t-shirts collected in thrift stores. It's an exhibition of creative domesticity, drawing largely on textiles and furniture to make pieces evoking warmth, comfort, and intimacy. "When you do really personal work — which I do — you have to think: why should anybody care?" said Spector. "My answer is: because it's about you, too." Museum visitors will be able to contribute to the show during its seven-month run. Spector will host workshops to make tomato-shaped pincushions, that will be added to a plinth already covered with some of her own "tomatoes." Tomatoes, Spector says, were traditional housewarming gifts in the Victorian age.